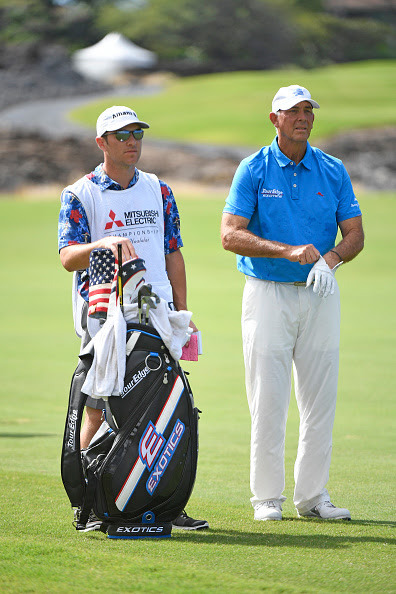 When Tom Lehman opened up the 2019 PGA Tour Champions season with a victory at the Mitsubishi Electric Championship at Hualalai, he did so with the brand new Exotics CBX 119 hybrid by Tour Edge in the bag. Tour Edge announced that Lehman officially signed a deal to wear a Tour Edge Exotics logo on his chest, to carry an Exotics CBX 119 staff bag and to play their Exotics metalwoods just a few days before the season-opening win. Lehman officially put the Exotics CBX 119 18-degree hybrid with a Project X EvenFlow Black shaft into play for the win. He also had a #2 Exotics CBX Iron-Wood in play. 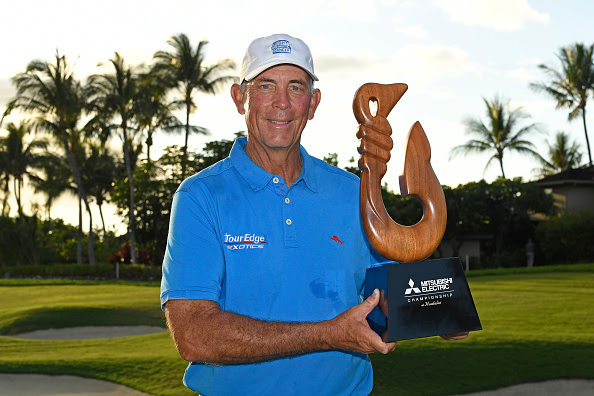 Lehman erased a four-stroke deficit and won the Mitsubishi Electric Championship at Hualalai by a stroke on the final hole. Lehman finished with a 17-under 199. He caught the leader with three birdies in a four-hole stretch at Hualalai Golf Club and sealed the win with his second straight 7-under-par 65 round. The victory was Lehman’s 12th PGA Tour Champions victory and his 2nd in the past two seasons while playing Exotics golf clubs. In 2019, Lehman will be wearing a Tour Edge Exotics logo and carrying a Tour Edge bag all season long. He will also expand his club usage to other categories with Tour Edge Exotics clubs. Lehman served as an Exotics CBX hybrid staff player in 2018 and played Tour Edge Exotics CBX hybrids all year en route to a PGA Tour Champions victory and an 18th place ranking in the Charles Schwab Cup. Lehman earned nine Top 10’s including 1st, 2nd and 3rd place finishes in 2018. According to the Darrell Survey, six Tour Edge Exotics clubs were in play in the smaller and restricted Hawaii field, including the two winning clubs by Lehman. Exotics staffer Scott McCarron finished tied for 18th playing Exotics EXS hybrid to start the season, while another 2018 winner with Exotics on the PGA Tour Champions finished T25 with an Exotics CBX fairway wood. In all, over 50 players have put over 300 Exotics clubs into play since Exotics was launched to the tour. Eight out of the Top 25 players (32%) in the Charles Schwab Cup final standings and 16 out of the Top 50 players put Exotics into play in 2018. Exotics products bring futuristic technologies to the marketplace with tour preferred designs and smaller production runs. Exotics clubs utilize higher-grade, avant-garde materials and manufacturing methods that have led Exotics to establish itself as a leader in quality craftsmanship and to redefine what is possible in golf club performance. « back-to-back holes-in-one at the par-3 third hole on the private club’s Apache Course.